The year was 1995 and Michael Jordan was (temporarily) retired from the game of basketball. This meant there was room for other stars of the NBA to shine brighter than ever. While players like Reggie Miller, Shawn Kemp, Scottie Pippen, and Hakeem Olajuwon were all marquee names during this time period, there was perhaps no bigger star than the young Anfernee “Penny” Hardaway, who seemed to fill the superstar void created in Air Jordan’s absence. With his skilled, graceful, and versatile play, Penny had won over the hearts of NBA fans of all ages, while helping lead Shaquille O’Neal and the Orlando Magic to the Finals in only his second season. Any player that talented and marketable should definitely have his own signature sneaker, right? Nike obviously agreed with that logic and rewarded Penny with his first official signature shoe for the 1995-96 season, the Air Penny. Although Jordan was back from retirement by then, Penny was more polished than ever as he stepped up with more scoring and all-around great play for the Magic while Shaq was injured at the beginning of the season. His more than successful 95-96 campaign as an All-Star Game starter, member of the All-NBA First Team, and leader for the Magic’s franchise record 60-win season was complemented by the shoes on his feet, which are still today considered one of Nike Basketball’s greatest designs ever. After a solid lineup of PE's and non-official signature shoes from Nike like the Air Up and Air Flight One, Penny received his first official signature model in 1995 with the Air Penny. Crafted by legendary Nike Basketball designer Eric Avar, the unique shoe was ideal for the versatile and explosive Hardaway with wing-like lateral support, maximum cushioning with Air Max2 in the heel, and Zoom Air (then called Tensile Air) in the forefoot. The Air Penny was something Nike’s basketball department had never designed before: a shoe that, like Penny, fit somewhere between the Flight line for guards and the Force line for big men. Penny’s versatile style of play basically inspired a new line for Nike Basketball, which would become known as Uptempo: shoes designed for players who were light and quick, but maybe needed a little more cushioning and support. As mentioned above, the Air Penny’s most distinguishable and iconic design feature is its large wing-like panel. This Phylon wing not only gave the shoe a look unlike any other before it, but it offered lightweight lateral support for fast cuts on the court. Looking back now, it’s easy to see that this wing was the precursor to Foamposite technology, found on a later Penny signature shoe designed by Eric Avar, the radical Air Foamposite One. Complementing the support wing is a large jeweled Swoosh with a unique scribble pattern within. Elsewhere the Air Penny features a speed lacing system, pin-striped tongue inspired by the Magic uniforms, and its last notable detail: the debut of Penny’s 1 Cent logo on the heel. 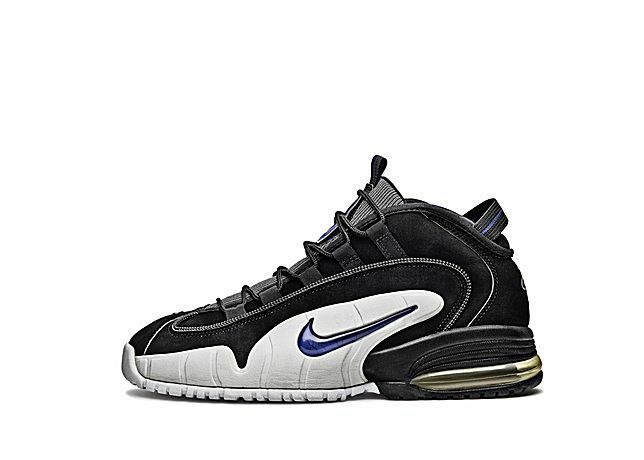 There were originally only three colorways of the Air Penny released, including the iconic and most popular “Orlando” look in a black Nubuck upper with a contrasting white wing and royal blue accents, along with primarily white and black versions. Even though the Air Penny has been retroed quite a few times now, oddly enough neither the original white or black colorways have ever re-released. That may change soon though, as both are rumored to be coming back later this year. With its unique and groundbreaking design, Penny’s best NBA season ever, and a little help from Lil’ Penny in the shoe’s marketing campaign, the Air Penny 1 became not only the first shoe in Hardaway’s successful and beloved signature sneaker line, but according to many, the very best.